Oil on canvas, 46 x 36 cm. A young girl with downcast eyes and a fur-lined, pale pink dress is staring dejectedly into space. The portrait is dominated by a frontal diffused light that enhances the shiny surface of the dress and the warm glow of her face. 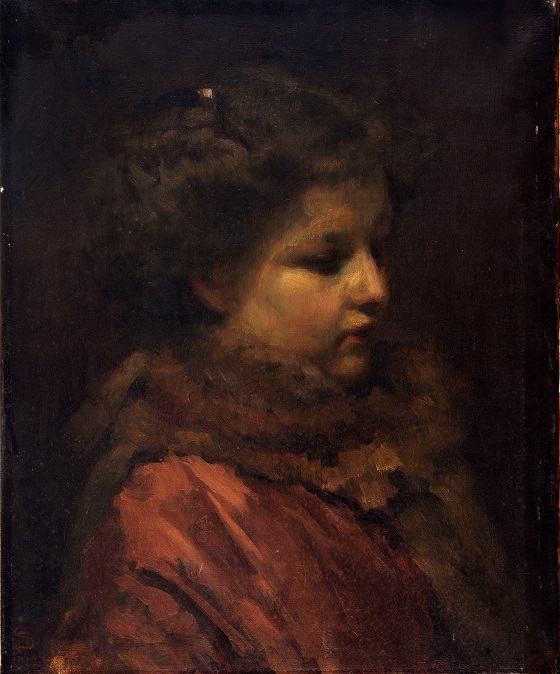 The conspicuous brush strokes, diffused lighting and use of chiaroscuro, where the contrast between light and dark is highlighted, suggests he was influenced by Rembrandt van Rijn and his portraits. At the same time however, the portrait can also be regarded as a Danish equivalent of the French valeur painting, where closely related colour tones in varying shades of light and dark are brought together to form a whole.